Professional or amateur, doing things the hard way doesn’t always make for better results. Take photography as an example. Once upon a time, the success or failure of what happened during the instant that the camera’s shutter was open was only known hours or days later after processing the film. Ruin the shot with bad exposure or suboptimal composition? Too bad. Miss a once-in-a-lifetime moment as a result? Ouch. Once instant photography came along, pros were quick to adopt it as a quick and dirty way to check everything before committing the shot to higher-quality film. Camera manufacturers made special instant film cartridges that could be swapped for roll film, and charged through the teeth for them. Unwilling to shell out big bucks, [Isaac Blankensmith] hacked his own instant film back for his Hasselblad medium-format camera. The unlucky donor camera was a Fujifilm Instax, a camera that uses film packs similar to those used by Polaroid and Kodak instant cameras from the 70s and 80s. Several of these cameras were dissected – carefully; those flash capacitors pack a wallop – and stripped down to the essential film-handling bits. An adapter was fabricated from laser-cut acrylic to mount the film back to the Hasselblad, with care taken to match the original focal plane. The shots are surprisingly good; despite a minor light leak from the adapter, they’re fine for the purpose. The best part: the whole build took just 48 hours from conception to first shots. Speaking of Polaroid, we’ve featured quite a few hacks of Edwin Land’s venerable cameras over the year. From replacing the film with a printer to an upgrade to 35-mm film, instant cameras in general and Polaroids in particular seem to have quite a following among hackers. Thanks for tipping us off, [macsimski]. The people who make neon signs are a vibrant community with glass bending and high voltage electronics. There is a need, though, to sequence these neon signs, and it seems like MIDI is the way to do it. That’s what [david] is doing for his entry to the Hackaday Prize, and the results already look great. 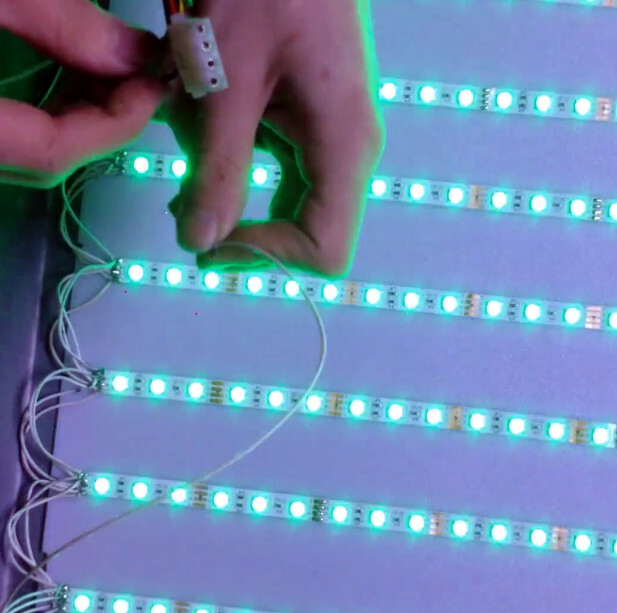 The idea for this project is to transmit MIDI data to a controller that activates neon tubes accordingly. As for why [david] chose MIDI over DMX512 or some other protocol, the object here is to sync with music, and if you already have a drum machine sending MIDI out, you might as well just patch into that. The build uses an Arduino Leonardo with a MIDI shield produced by Olimex. This shield is connected to a neon power supply that has control circuitry to quickly and easily turn neon signs on and off. The end result is a laptop (with the rest of the DJ software) sending a MIDI clock signal to an Akai drum machine. This drum machine outputs MIDI notes to the shield, which is currently set up to control three neon transformers. The results look great, with flashing skulls synchronized with bleeps and bloops. This, of course, can be expanded to even more MIDI synced neon signs. You can check out a few videos of the build after the break.